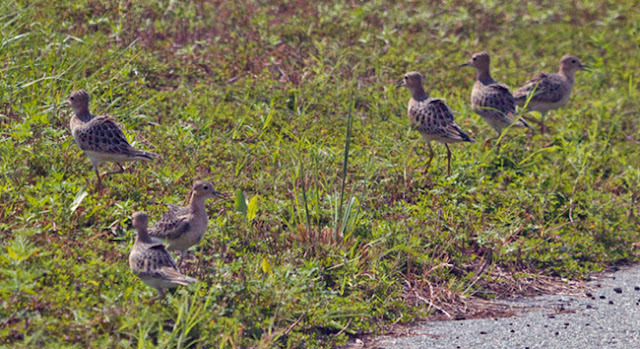 The buff-breasted sandpipers that I first found on Sunday, Sept. 13 on Hutchinson Island were still around as of Sunday, Sept. 20th. I went back looking to get some better photos on Saturday am and had no luck. 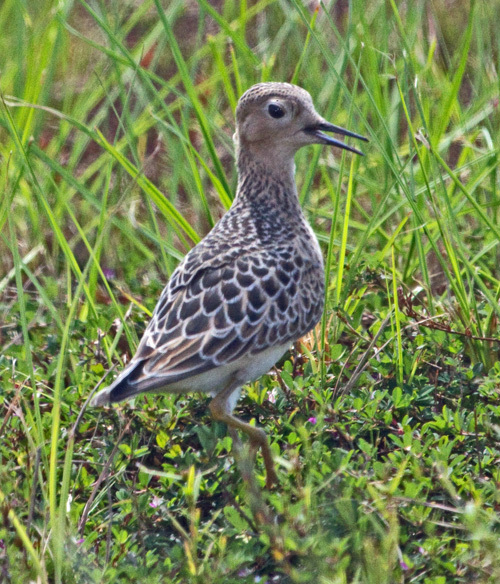 The birds (now up to 8!) 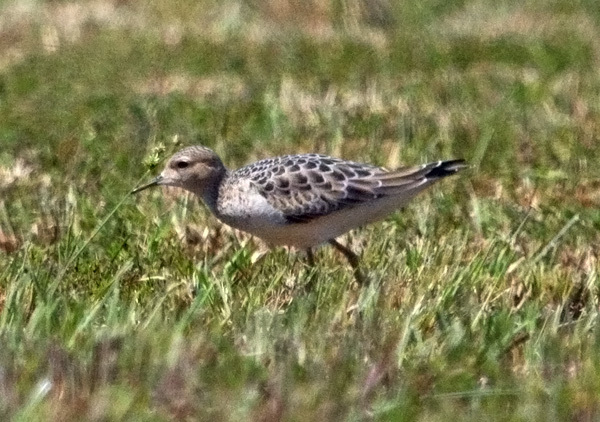 seem to fly back and forth between the fields at the Reserve and the nearby greens of the golf course. Sunday morning I returned and got distant looks of the birds on the golf course. 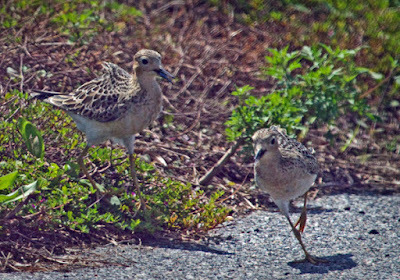 Russ Wigh was there bragging about how he had just been photographing the birds in the Reserve, and that they had returned when I had to leave for Church! Argh. I went back after Church. It was then hot and still with nothing much going on. Put persistence pays off. I finally found not one or two but all eight buff-breasted sandpipers feeding along the edge of one of the roads. The mid-day light was a bit harsh and I couldn't avoid some back lighting. 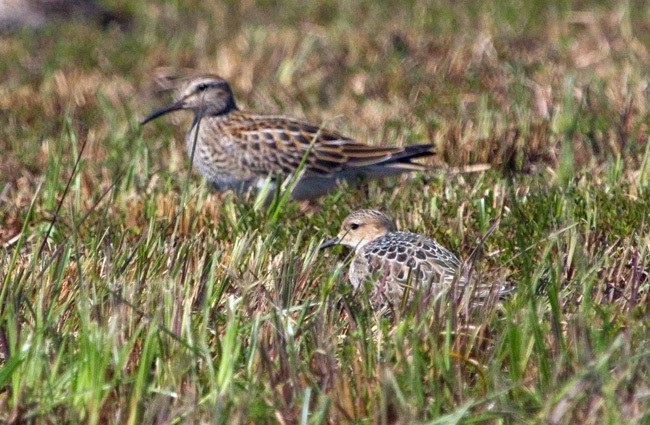 Still, it was wonderful to spend an hour and a half of quality time studying these beautiful birds. Look who snuck in! 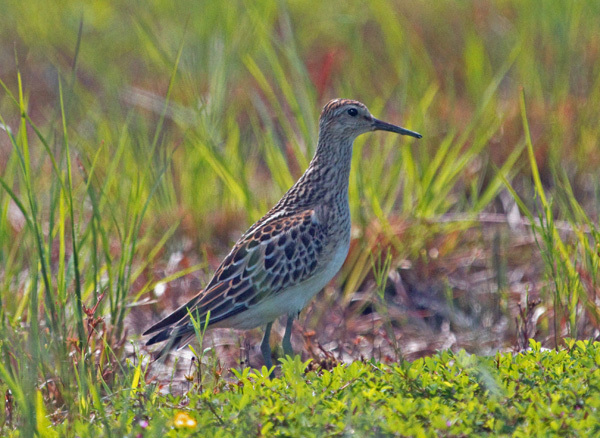 The numbers of pectoral sandpipers were down from the previous week. It was hot! Lots of posing with open mouth. Check out my patterned back! The other interesting sighting from Sunday morning was a pair of Red-tailed Hawks hanging out together. 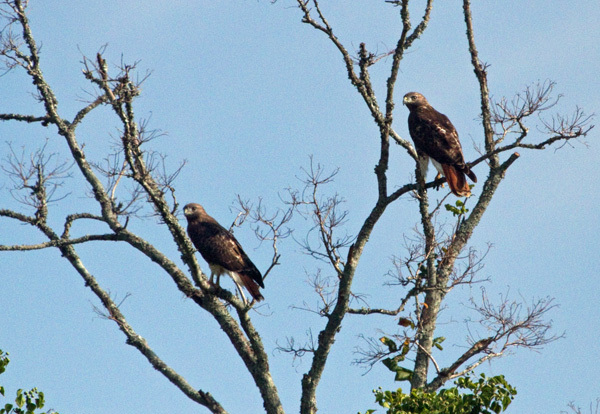 A pair of Red-tailed Hawks survey the scene. When I went outside on the morning of Sunday, Sept. 13th, the first thing I noticed was that it was cooler outside than inside. It was breezy and there was no humidity!!! I geared up with my anti-mosquito garb and went to scout the neighborhood for migrating songbirds. 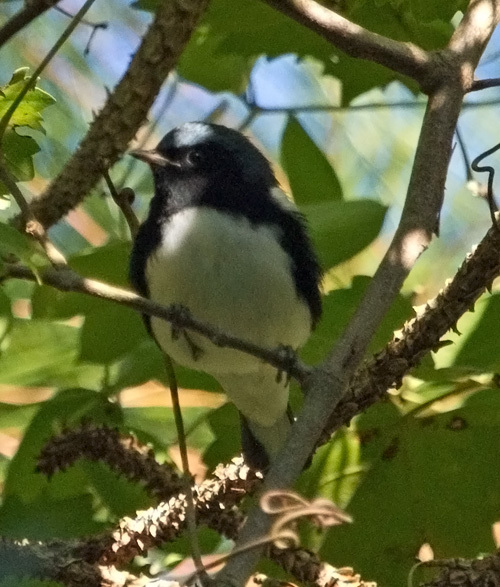 In one small wooded area I found seven species of warblers - Black-throated Blue, American Redstart, Prairie, Ovenbird, Northern Waterthrush, Northern Parula, & Black & White. 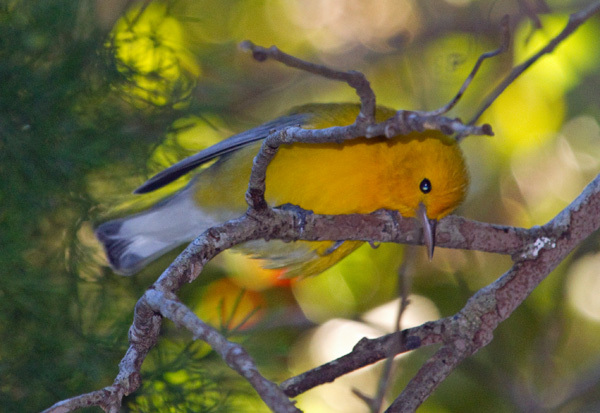 Later that day I added Prothonotary to the list. 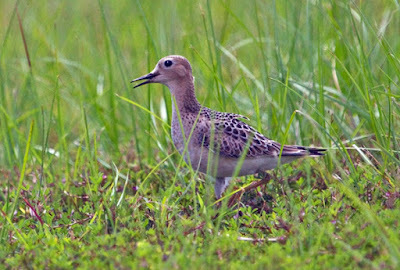 After church, I decided to make a trip over to Hutchinson Island to see if I the cool winds had brought in other birds. The first thing I saw as I entered the reserve was a large flock of birds soaring above the river. I caught glimpses of black and white. 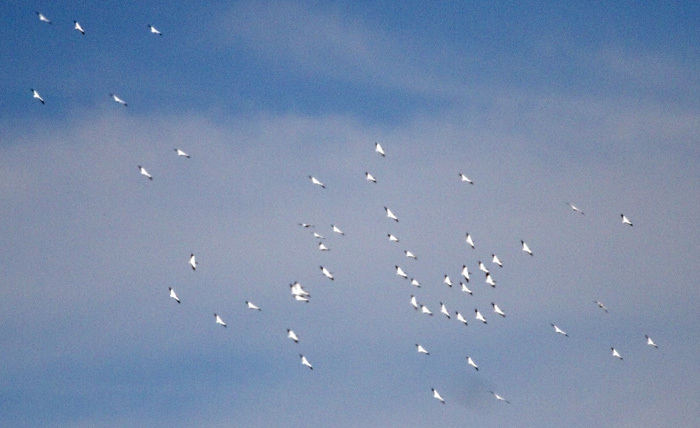 They were American White Pelicans - more than 60 of them. I didn't see much in the way of songbirds - an Eastern Kingbird, a Northern Mockingbird and several Loggerhead Shrikes. However, I noticed a large flock of shorebirds hunkered down in the recently mowed, still muddy grass. 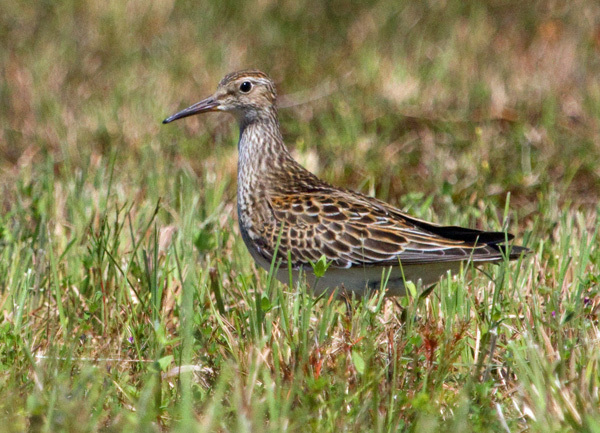 On closer inspection, I realized they were Pectoral Sandpipers. 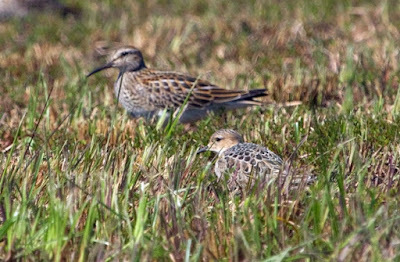 Pectoral Sandpipers hunkered down in the grass. After counting more than 100 of them, I kept driving around thinking that maybe there would be something else mixed in with the group. 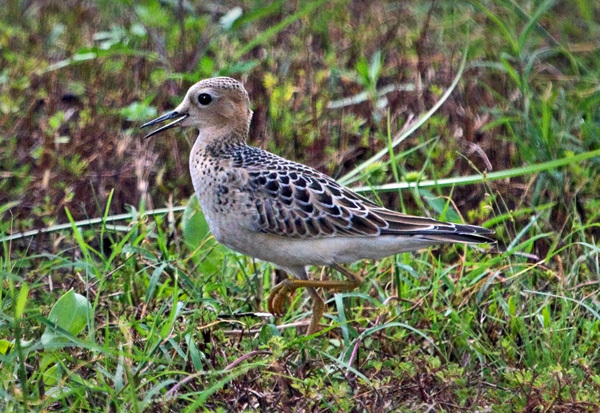 At last I saw it - with a more delicate bill and buffy color - a Buff-breasted Sandpiper! And I didn't even have to drive to the Marshallville Sod Farm! I studied it carefully, took photos and then sent text messages to my friends. It settled down in the grass and I could compare it to the Pectoral Sandpipers nearby. 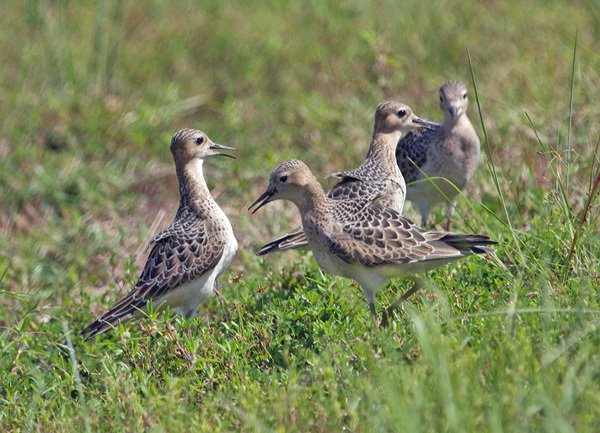 Later that evening, while Larry Carlile was observing the birds, most of the them flew off in the direction of the Golf Course. Steve Wagner went over there to scan the driving range and found 200+ Pectoral Sandpipers and 5 Buff-breasted Sandpipers. 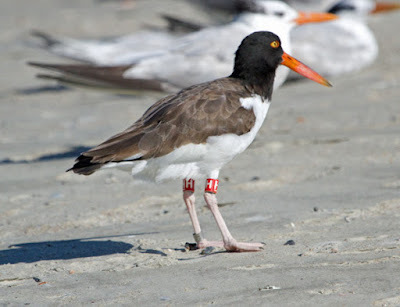 Today, on a happy Tybee note, I went to the North Beach and found a flock of 14 American Oystercatchers resting among the gulls and terns. I was thrilled to see RedHH - one of the chicks that fledged on the North Beach last summer and that I helped to band. 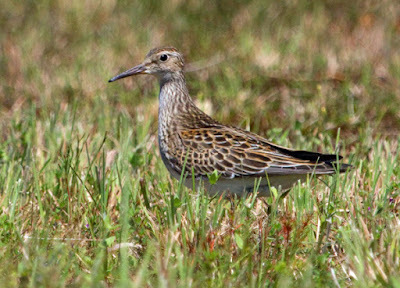 Great to see that it survived the winter, spring and summer to return to the place where it was hatched!